Jabari Bird and L.J. Peak lead the way with 23 points apiece. The shot clock was winding down in the final minute of Thursday night’s G League basketball game at the Portland Expo. Trey Davis, dribbling near the top of the key, glanced to the right corner at teammate Jabari Bird. Bird returned the look, and each remembered their conversation at halftime about Bird going back-door along the baseline. Sure enough, Davis made a move to the right elbow and put up what seemed to be another push shot, only short of the rim. 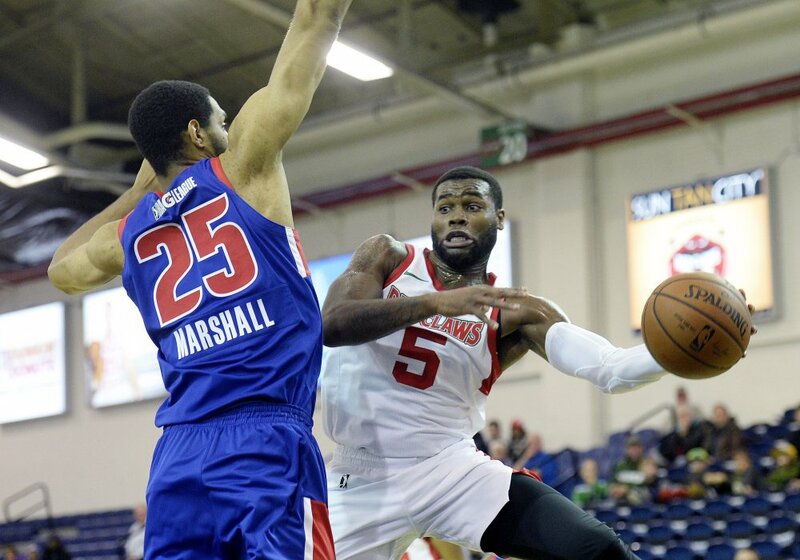 Bird came flying in to grab the pass and stuff it through the hoop for the prettiest play of the Maine Red Claws’ 99-96 victory over the Grand Rapids Drive before a crowd announced as 1,592. Coming on the heels of Bird’s tiebreaking 3-pointer half a minute earlier, the basket gave the Claws a five-point lead with 25 seconds remaining and should have sealed victory. Instead the Drive scored two baskets in three seconds – 6-foot-10 center Landry Nnoko on an inbounds play and fouled in the act of dunking; he missed the free throw but Derek Willis put back the offensive rebound to make it 97-96 with 21 seconds still to play. “They’re a tough team,” Bird said. “We talked about that in the scouting report that no matter what, they’re going to fight to the end, and that’s exactly what they did. Maine’s Andrew White gets a step on Kenneth Smith of Grand Rapids. Grand Rapids fouled L.J. Peak on the next possession and he made both free throws for what turned out to be the final points of the game. Peak proceeded to steal the inbounds pass but missed two potentially clinching free throws, giving Grand Rapids two more chances at 3-point attempts to force overtime. Both shots missed and the Claws had their fourth victory in five games. Grand Rapids is 4-3. Maine’s L.J. Peak takes a shot over Malcolm Bernard of Grand Rapids. Bird and Peak each finished with 23 points, and Davis scored 16 of his 21 in the second half. 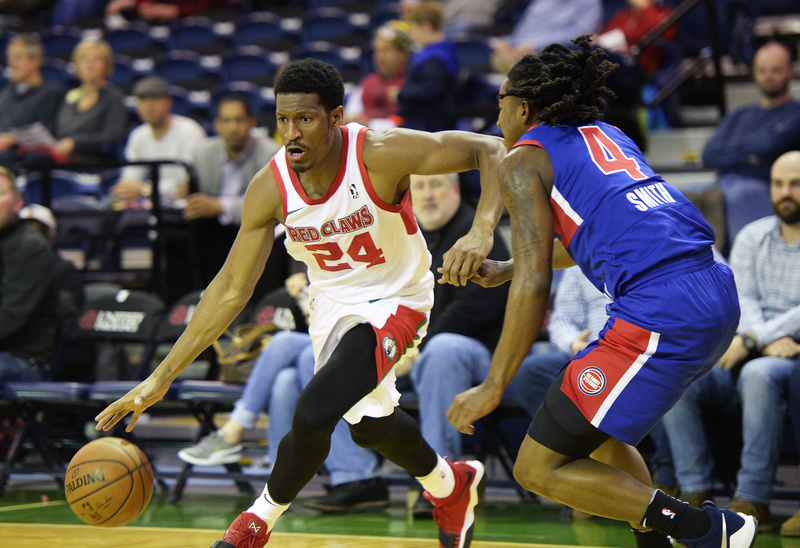 Willis led Grand Rapids with 18 and Luis Montero added 16. The lead changed hands 12 times. Just as Grand Rapids opened its largest lead, 37-29 in the second quarter, Peak responded with two tough drives through traffic and a 3-pointer from the top of the key to cut the margin to one. A starter in every game he had been healthy, Peak came off the bench Thursday night and wound up playing 35 minutes because starting point guard Kadeem Allen banged his knee in the first quarter and didn’t return. 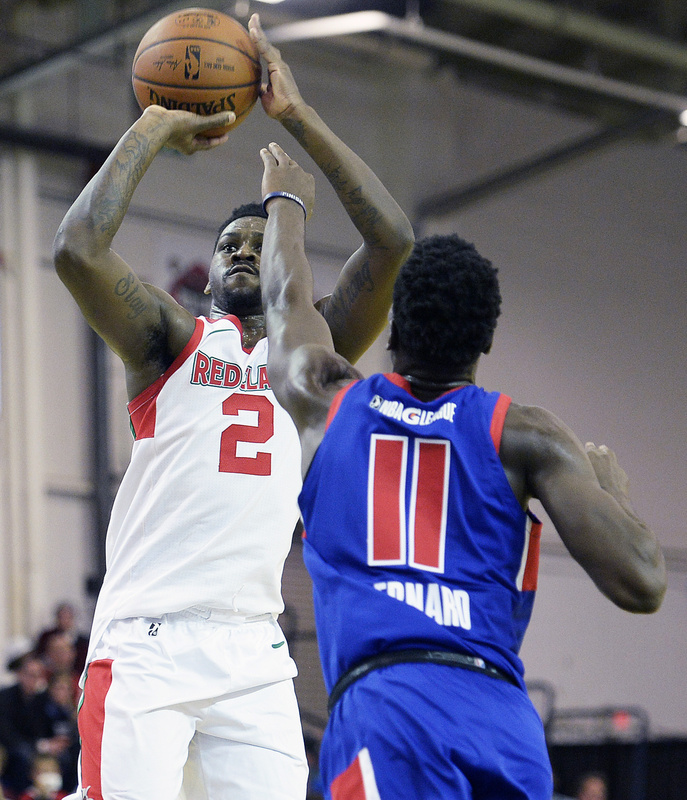 Bailey earned his first technical foul since coaching AAU basketball when he objected strenuously during a third-quarter stretch in which Grand Rapids went on a 15-0 run aided by nine consecutive free throws. 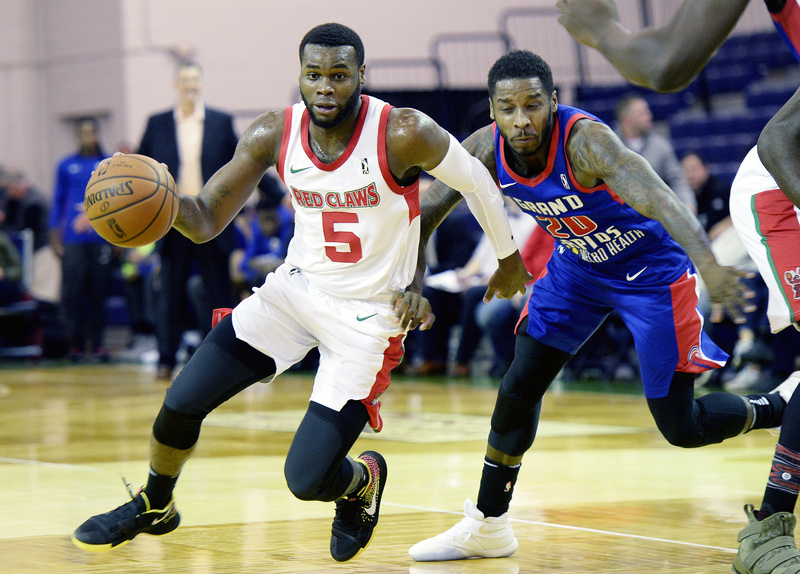 Kadeem Allen of the Maine Red Claws drives to the basket past Dwight Buycks of Grand Rapids. Davis bailed out his coach by draining three 3-pointers in the final 1:11 to give the Claws a 76-75 lead entering the fourth quarter. After games in Wisconsin on Saturday and Fort Wayne next Friday, the Claws return to the Expo on Nov. 26.